Your diamond engagement ring. It's the most precious thing you own. You will want to wear it every day, but what if it is lost, stolen, or damaged? An insurance policy will help to protect your new investment, but first you need a fine jewelry appraisal by a qualified, independent appraiser. And what is that? An appraisal is a unique document prepared for you and your insurance company; it is a detailed report, written by a trained gemologist, describing your own ring and its value. 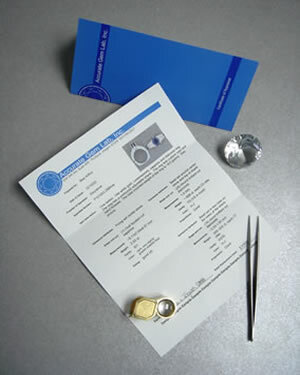 An appraiser will examine your diamonds with a gem microscope and special instruments to determine their total carat weight, clarity, color rating, cut quality, and value of precious metals and workmanship. Your ring might be an antique heirloom or a contemporary, custom designed style. It may contain colored gemstones or a hand engraved matching band. Each of these details is researched; they add up to a monetary value, or the retail replacement cost. An experienced appraiser will arrive at this price using the current market standard for diamonds and gemstones. A detailed, professionally written document and photograph leave no room for question if the item is lost or stolen. Insuring your cherished engagement ring for its retail replacement cost does not cover its sentimental value, but it does cover the expense of having a new one made if the original is lost, stolen, damaged, or mysteriously disappears.